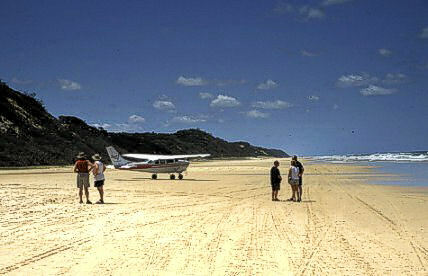 There is a beach of 75 miles on the outer side of Fraser island. That sounds great, but due to currents, sharks and jellyfish it's no safe place to swim. But it's wonderful sandy and flat so it can be used as a highway for cars and buses, even as a runway for airplanes. All along the beach I found spiny balls rolling along with the breeze. When taking a closer look these balls of two fists size turned out to be gras seeds. 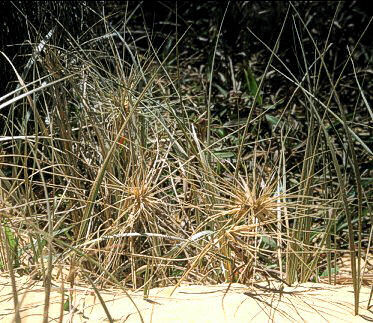 Our guide said it was Spinifex gras, but as botany wasn't his favoured subject, I initially did not really believe him. Now a visitor of this site, Chris Martin, found it out for me: it's Spinifex sericeus, the Sand spinifex grass. Find more information about it provided by the Environmental Protection Agency. All I can add is my attempt to photograph just one of these balls. As soon as released, it rolled away in high speed with the slight breeze. That's why we have to be satisfied with this one looking a bit upside-down. Do a better pic, if you know how to catch it!